that delivers high quality water for its health and safety needs. Rainfall year (Year to Date) is from October 1 to September 30. Crestline Village Water District is pleased to announce our billing system software upgrade is almost complete! Our customers will soon be able to make online payments through our website! We are also going green and will offer paperless billing for those customers who prefer this option. In an effort to better serve our customers, credit card payment options are in the works. April bills will look slightly different. If you have any questions regarding the new bill contact the office and we'll be happy to help. You may receive your April bill a little later than normal as we go through this transition. Crestline Village Water District was formed in 1954 to serve water to the Crestline Village area. In 1979, the District was asked to serve the Lake Gregory area. Today, the District serves water to about 4,950 properties within its service area. Crestline is located in the San Bernardino Mountains in Southern California, north of San Bernardino and west of Lake Arrowhead. 7:30 AM to 4:30 PM - Monday through Friday. Water Emergencies: If you have a water emergency when we are closed, call our office at 909-338-1727 and leave a message. Our serviceman will be paged and will return your call. Click here to see a list of days the business office is scheduled to be closed. Additional Information: For additional information, please do not hesitate to call us at (909) 338-1727, or e-mail us at cvwater@cvwater.com. You can also send us correspondence at the address at the top of the screen, or come and visit us at our office. 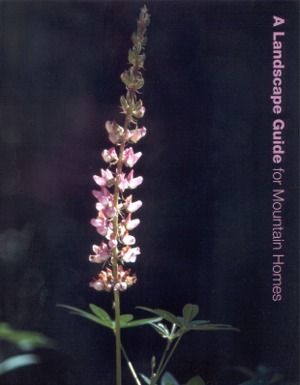 "A Landscape Guide for Mountain Homes"
This guide was developed especially for the San Bernardino Mountains. Stop by the office and pick one up. Information Notices Check here for additional information regarding District programs and policies.